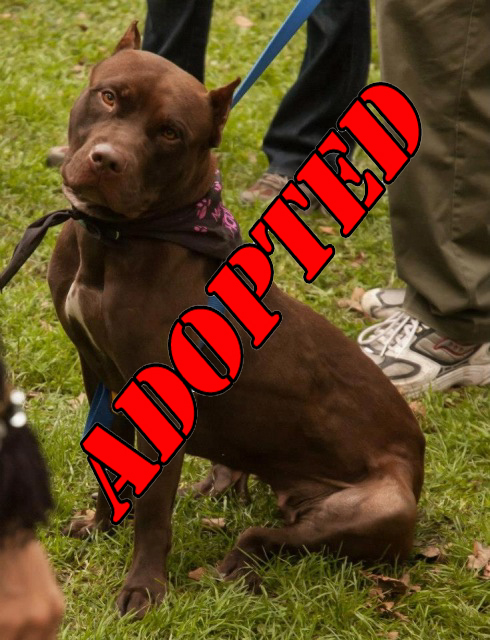 After less than two weeks, and really almost no work on our part, our very special Ethel has found her forever home. Sometimes, we just get lucky and rescue wonderful dogs, and then we get even luckier and perfect adopters appear out of thin air. Well, this was one of those times. 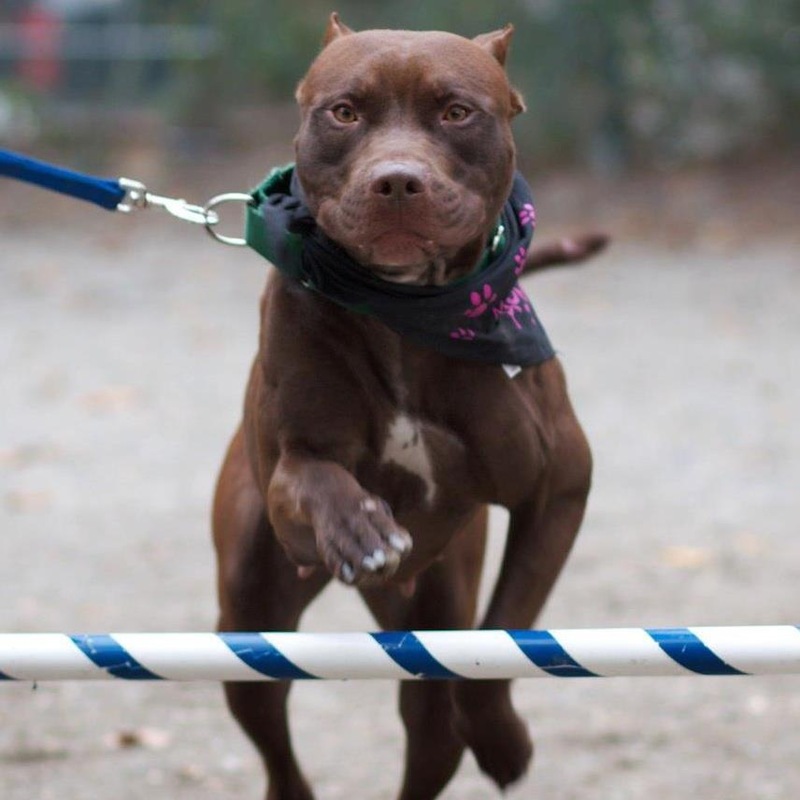 We posted Ethel as our Adoptable Pittie of the Week last week, and almost immediately after publishing that post, we listed her on all the standard online pet databases. And in less than 10 minutes, we had our first inquiry – a young, self-employed photographer living in Brooklyn who was looking for a new dog after his last one passed away from cancer. His email really didn’t show us anything very specific, but after checking with his vet, and references, we couldn’t have been more thrilled. Peter seemed like an ideal candidate. So we arranged a meet & greet for later in the week, as Josh had to go out of town for two days for work. 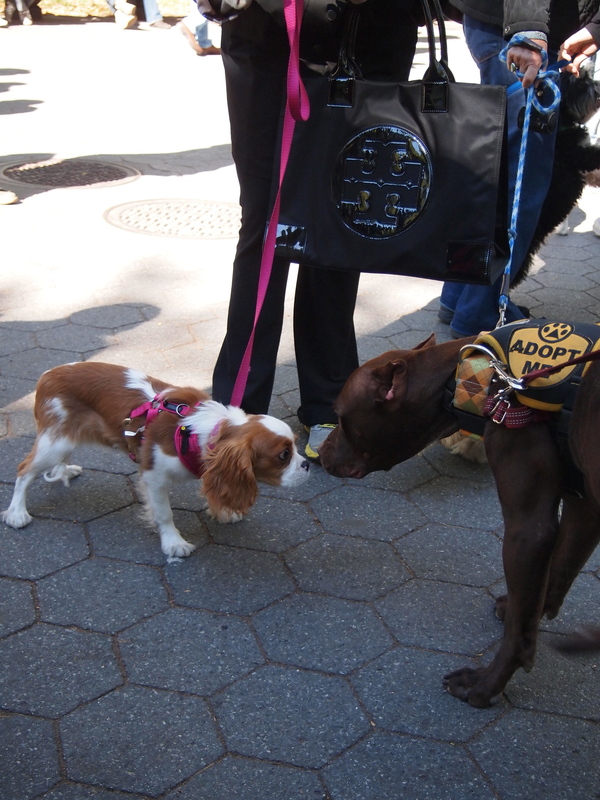 During that time, Ethel got some very special attention at a temporary foster home. She got individualized attention, lots of cuddles, great food and toys and a lifelong friend from her temporary foster mom, Rennie. But her vacation there quickly came to an end, and the day after Josh returned, we had our meeting with Peter who, like everyone else who’d met Ethel, fell in love with her immediately. 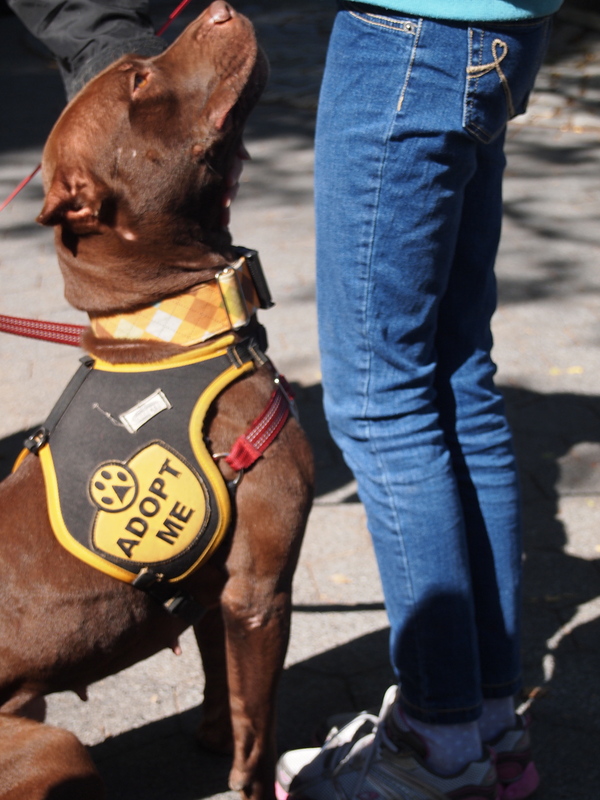 The papers were signed, hands (and paws) shook, and off Ethel went off to become the newest resident of Brooklyn! We have to give a very special thank you to Deja Foundation, who helped cover Ethel’s medical costs to make sure she was as healthy as she looked. And the biggest thanks go to Rennie, who stepped up in our time of need to take care of Ethel for two days. To make room in your life for a homeless pet for even just two days is more helpful than anyone can ever imagine – and we are immensely grateful! Last week, I posted about a friend who was having trouble with their dog who’d just been spayed. Well, folks, you may have guessed this, but: “my friend” was me and “their dog” was Ethel. Whatever I would do, she just wouldn’t cooperate and wear her cone calmly. So I reached out for your help. 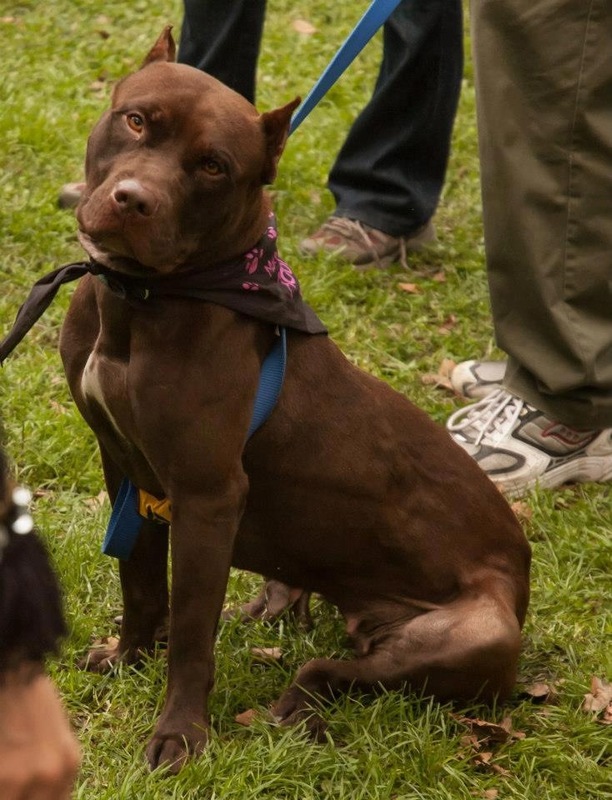 I had to fib a little because Ethel wasn’t yet officially adoptable, so I couldn’t write about her yet. But I was just at a loss. How could I leave her home, while I was at work, and know that she was ok? This simple statement reaffirms the idea that every dog is an individual, and that includes whether or not they need to wear a cone post-surgery. So thank you Megan, for yet again opening our eyes and helping us help Ethel. It actually worked out in Ethel’s favor anyway, as she got to tag along to Josh’s office for the week and sneak into a little Wordless Wednesday action! Have we got a special one for you today! Meet Ethel! So why is Ethel so special? 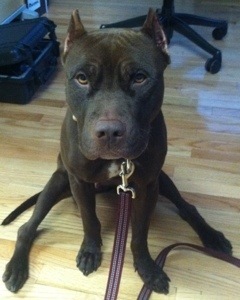 Well, first and foremost, she’s Bully Project‘s newest adoptable, and secondly, she’s Josh’s new foster! And this girl is an absolute rockstar! Crate trained, house broken, obedient, dog friendly, people friendly, walks beautifully on leash, doesn’t bark or whine, comfortable when left home alone. I mean, this dog is as rock solid as a, well, a rock. 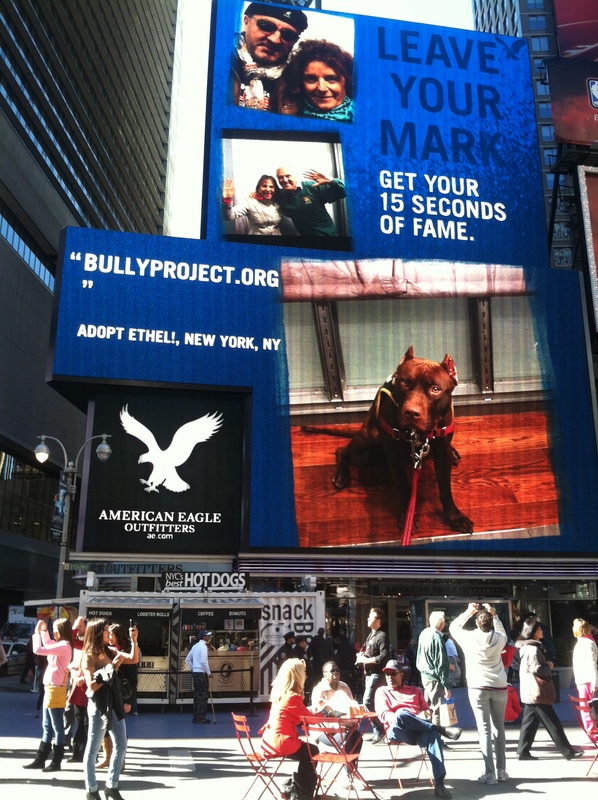 She’s so special, that she was even featured on a jumbotron in Times Square! That’s real, folks – not photoshopped! We took her shopping for new jeans, and the staff in the store loved her so much, that they offered to put her picture up on their billboard! We are so proud! 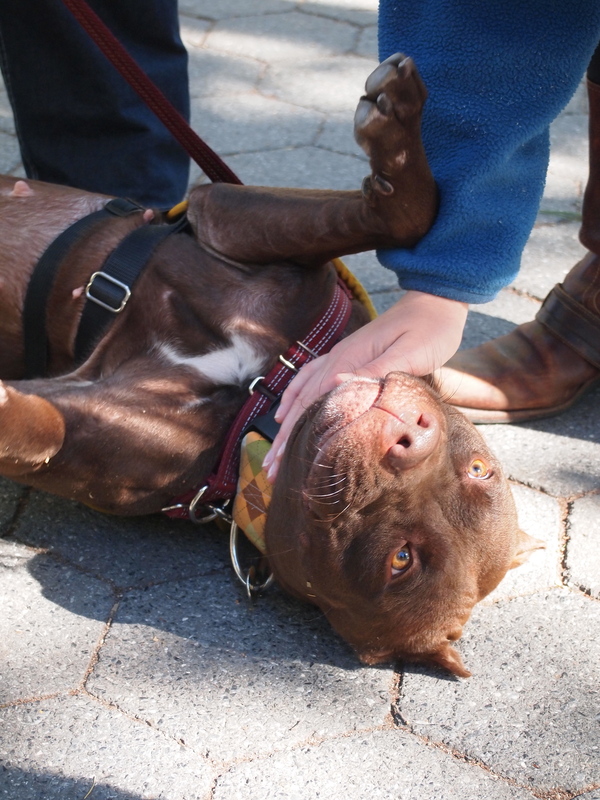 And she just loves meeting new people on the street – so much so that she just rolls over onto her back for belly rubs. 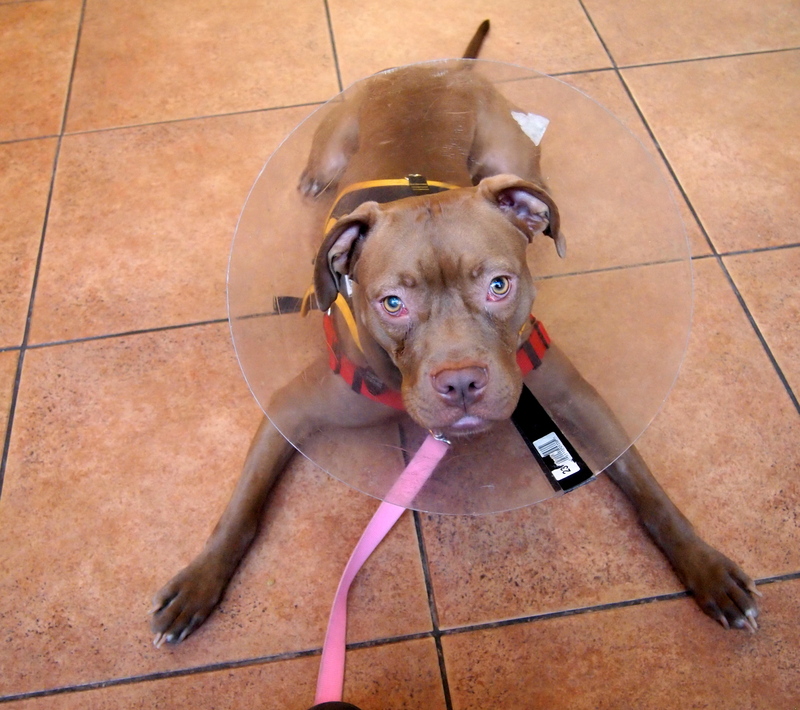 Ethel is already spayed, fully vaccinated and microchipped. She’s 100% ready for her new home. Any home. She’d be great with kids, adults, dogs, and most likely cats as well. She’d be perfect for the new dog owner, and great with an experienced one. 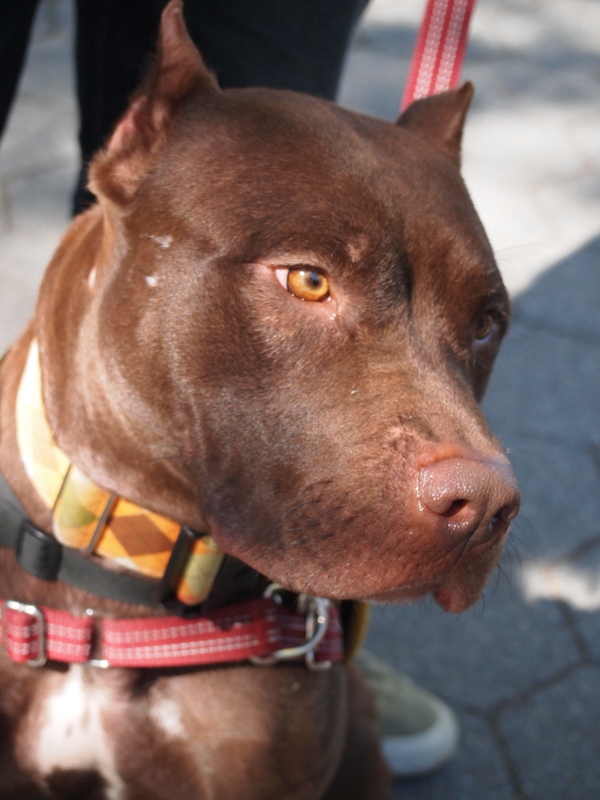 So we’re calling all adopters: please email us at bullyprojectnyc@gmail.com to apply to adopt Ethel! What do you do if your just-recently-operated-on dog absolutely refuses to wear a cone or other such device? A friend of ours has very recently stumbled across this problem, and well, I’ve never had to tackle something like this, so I really just don’t know what to advise. Their dog was just spayed, and despite her grogginess, will do whatever it takes to remove her Elizabethan Collar, aka “cone of shame.” She went so far as to completely destroy it, leaving it in several different pieces. I suggested they try Kong’s Cloud Collar. No go – the dog had it ripped off in a matter of seconds, and it was simply not reusable. The vet even gave them a flimsy, but sufficient, fabric cone to try. After some compliance, the dog ripped that to shreds, too. So readers: any advice? 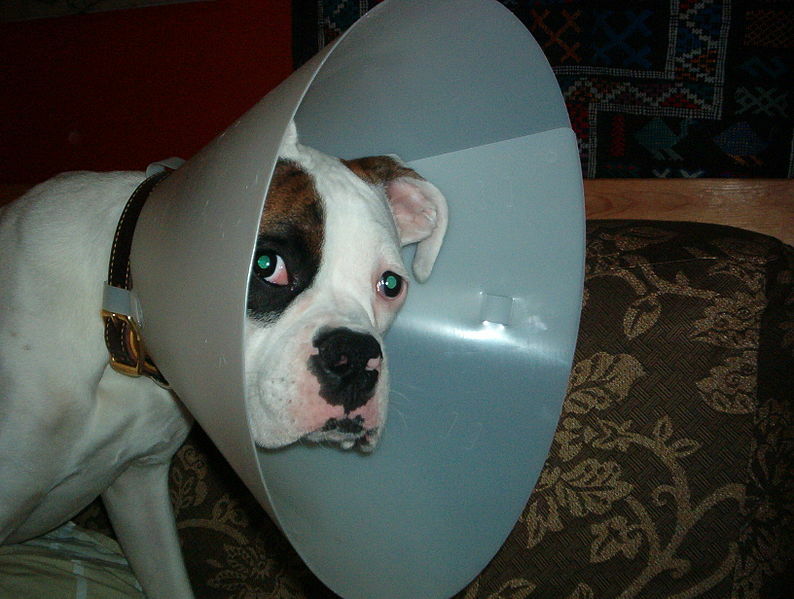 What tips, tricks and products have you used on your cone-resistant dogs?